Trouble stirs beneath Blackrock Mountain. Deep within the fiery cracks of the Molten Core, Ragnaros the Firelord is massing his elemental forces, posing a serious threat to the black dragon Nefarian’s mountaintop lair. Things are about to reach a flashpoint… better break out the cards and show these two how real heroes settle their differences: with a civilized game of Hearthstone! Blackrock Mountain throws you right in the middle of one of Azeroth’s most heated conflicts, the ancient feud between the elemental lord of fire, Ragnaros, and the powerful black dragon Nefarian, the de-facto leader of the black dragonflight. Nefarian would call himself the ruler of Blackrock Mountain, but Ragnaros and his elemental servants have been a thorn in the dragon’s side for far too long. This mountain’s not big enough for the two of them. Before you do the dragon’s bidding to take on the Firelord, ask yourself: Is Nefarian’s encouragement genuine, or are you just another pawn in the old wyrm’s schemes? Fight your way through five wings full of epic bosses and add their exclusive cards to your collection, defeat clever class challenges to earn even more new class cards, then take on Heroic Mode to prove once and for all who is the true master of Blackrock Mountain. Ready your deck. Watch your mana. Conserve health. And never, EVER, cut a deal with a dragon. Blackrock Mountain is a Hearthstone adventure that will test your skills like never before. 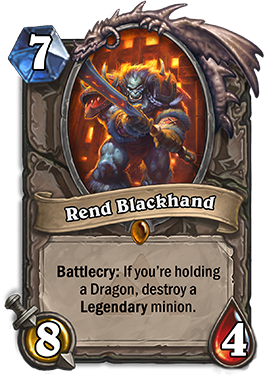 Legendary: When you clear a wing for the first time, you will be rewarded with that wing’s legendary card – for example, the cruel leader of the mountain’s orcish inhabitants: Rend Blackhand! Class Challenges: On top of the regular bosses, Blackrock Mountain also includes nine all-new class challenges. Class challenges pit you against a specific boss using a custom, pre-set deck designed to test your skill with the class in question. Succeed, and two copies of a new class card are yours. New Game Board: SO SHINY! Dragons: As one would expect, Blackrock Mountain is home to a variety of dragons. Prepare to see a lot more of these scaly, fire-breathing, adventurer-crunching creatures as you brave the mountain! Orcs, Dwarves, and Elementals, Oh My: Aside from dragons, there are plenty of other minions fighting on either side of the conflict: Dark Iron dwarves, fiery elementals, and the Blackrock orcs (who already had that name before it was cool). Heroic Mode: If you like a challenge, you can try taking on the Heroic Mode version of any mission that you’ve cleared. This extra-difficult game mode is designed for players who don’t mind taking on ridiculously unfair and overpowered opponents. Bring your best deck and plenty of patience. You’ll need it!